When you create a plant pond, you run the risk of introducing bacteria and other harmful components. Potassium permanganate (KMnO4) is a chemical with oxidizing qualities. It will react with the contents of a pond, such as bacteria, fish, sediments and algae, and kill fish pathogens such as fungus, parasites and bacteria. Rather than pour the substance into your pond, you can clean and treat each pond plant individually. This will disinfect them and protect the health of your pond. Remove the pond plants from the pond. If they are immersed in substrate like stones or gravel, separate the roots from the substance and let them dry out slightly. They should be damp, not wet. Pour the water into a tub, such as a garbage can or storage crate. Add 1 tsp. of potassium permanganate granules or powder. You can purchase it from a pond supply shop or hardware store. 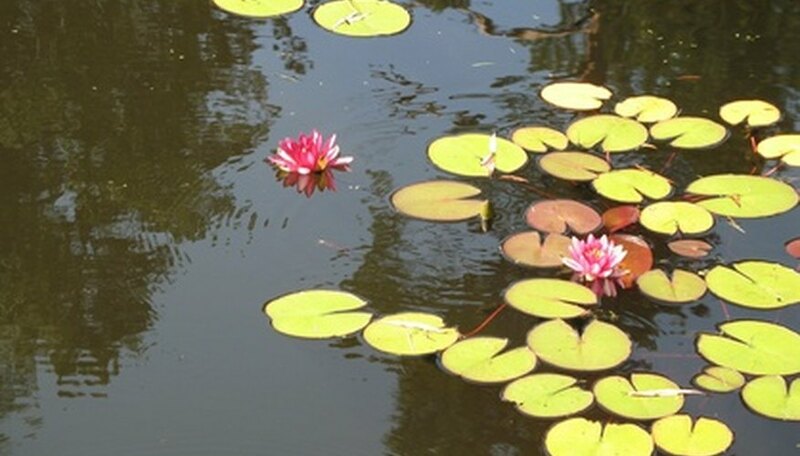 Consider using a potassium permanganate solution made to treat pond plants. The solution is pre-mixed. Simply add it to the water and follow the instructions on the label. Swirl the pond plants in the potassium permanganate/water solution. Make sure that the entire plant is immersed in the solution so that it becomes sterilized. Keep the plants in the sterilizing solution for 30 seconds. If you are using the pre-made formula instead, follow the manufacturer's guidelines. There may be less potassium permanganate in the mix, so the times vary. Take the plants out and immediately soak them in the 1-gallon bucket with clean water. This will help remove the chemical. Put 1 tbsp. of hydrogen peroxide in the water. This will neutralize the potassium permanganate. Soak the pond plants for a half hour. Remove them from the water and put them in the aquarium or pond. Always wear waterproof safety gloves because potassium permanganate can cause burns to your skin because it has a bleachlike effect. Do not use potassium permanganate powder on pond plants if it is windy outside. The powder will travel and can be dangerous if inhaled.